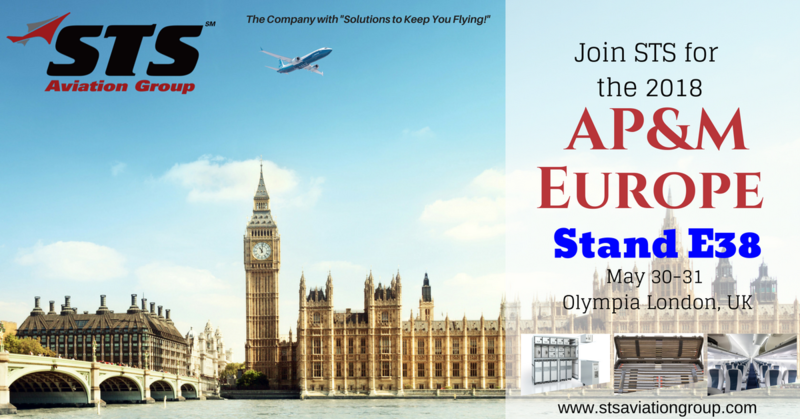 STS Aviation Group Gears Up for AP&M Europe in London! Since 2003, AP&M Europe has been commercial aviation’s leading aftermarket exhibition. This is the venue where the entire airline supply chain gathers under one roof, with over 200 industry suppliers display their products and services to over 4,000 aviation professionals in attendance. This event is unique in that it is free for all trade professionals to attend. You get unlimited access to suppliers offering the latest and greatest aftermarket products, services and technologies for two complete days. During this conference you can expect grand displays from all of the exhibitors and interactive show features such as the Aviation Furniture Display, the Chill and Charge Zone, VIP Lounge and Drone Racing! Meet the Buyers is the AP&M’s signature networking event which provides a platform for exhibitors to meet with buyers from airlines, MROs, OEMs and leasing companies, face to face, in pre-arranged 10 minute meetings slots. Other networking events include the VIP Welcome Reception, which is set to take place at Under the Bridge, a uniquely stylish west London music venue located underneath the iconic Chelsea Football Stadium! Members of STS Aviation Group, Tom Covella (Group President, STS Component Solutions), David Ikeda (Vice President- EMEA, STS Component Solutions), Craig Duncan (Regional Sales Director- EMEA, STS Component Solutions) Jim Naylor (Director of Sales- EMEA, STS Component Solutions), Omur Keskin (Regional Sales Director, STS Component Solutions), Ryan McComas (Account Manager, STS Component Solutions), Kerry Obiala (Director, OEM Product Lines, STS Component Solutions), Tyrone Barnsley (Sr. Sales Manager, STS Component Solutions), Chris James (Director of Sales, STS Air-Pro), and Caitriona O’Reilly (Operations Director, STS U Jet) will all be available to meet with during the conference to discuss any of your company’s aircraft component, OEM distribution, hose & interiors service and support requirements. This event is sure to provide many excellent opportunities for airlines, MROs, OEM providers and vendors to connect and create new partnerships, and enhance current business relations within the EMEA region and across the globe. Be sure to fly by Stand E38 during the expo to meet the STS team. We can’t wait to see you all in London!